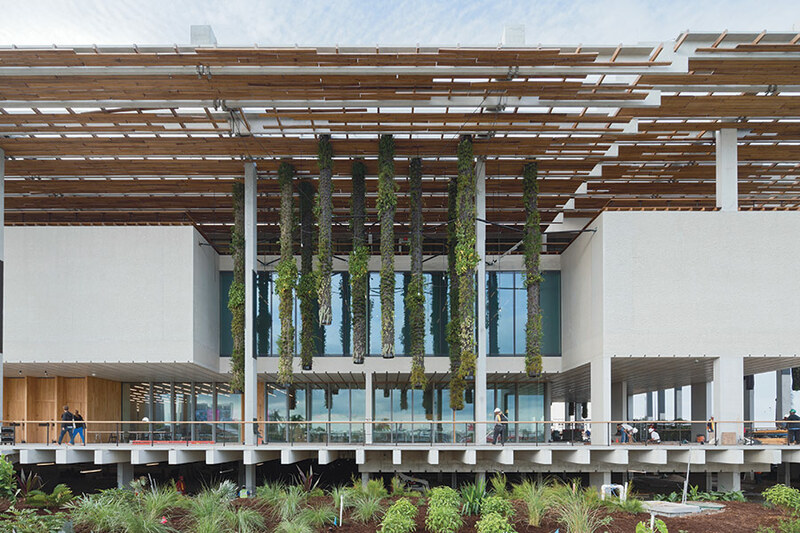 A concrete and wood canopy protects the museum’s extensive glazing from direct exposure to the intense Miami sun. Achieving this balance between openness and intimacy was a particular challenge when it came to the museum’s lighting design. 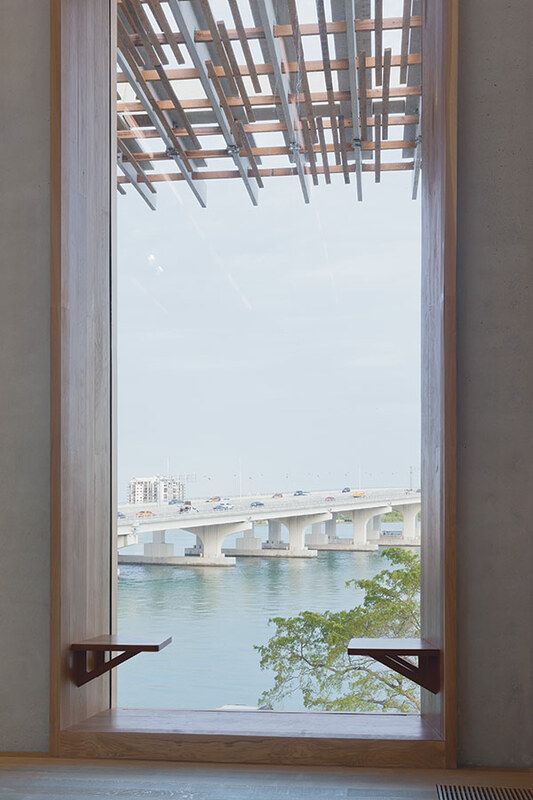 Herzog & de Meuron and executive architect Handel Architects employed the canopy not just to shade the outdoor spaces, but also to protect PAMM’s extensive glazing from the Miami sun. 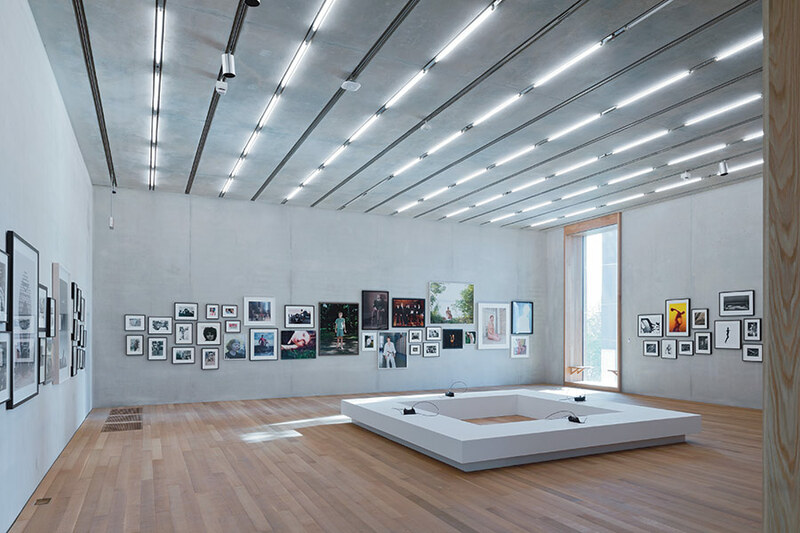 Inside the museum’s galleries, the architects opted for a combination of incandescent track lights (by Litelab) for highlighting the artworks and four-foot-long fluorescents (by Bartco) for ambient light. The addition of the fluorescent lights was “done both as a lighting strategy and as an energy-saving strategy,” said Matt Franks of Arup, the project’s lighting designer. 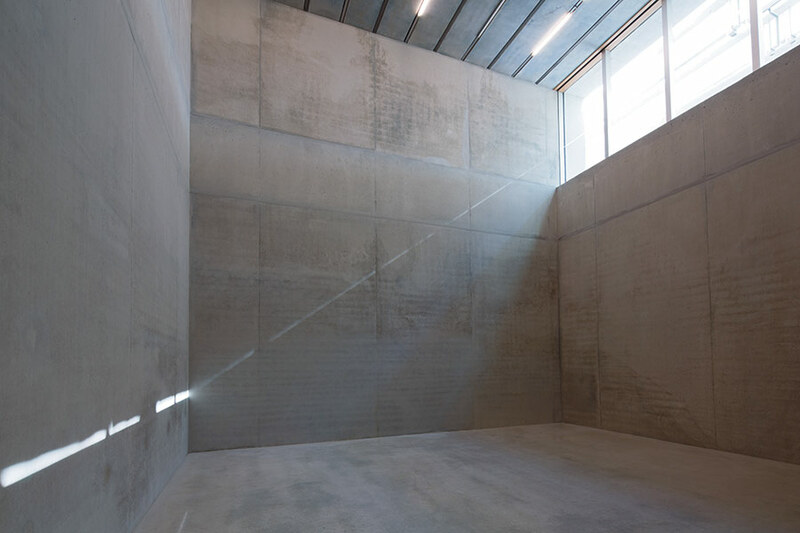 An automated dimming system adjusts the artificial light according to the amount of daylight coming in. The fluorescent lighting system extends throughout many of the museum’s non-gallery spaces, including the shops and bar. For the cafe, Herzog & de Meuron designed a simple custom pendant fixture—“really just a suspended lamp with a simple bulb in it,” said Franks. Daltile manufactured custom ceramic escutcheon plates, again designed by Herzog & de Meuron, for the ceiling and pendant lights in the museum’s restrooms and secondary corridors. For PAMM’s third-floor offices, Litelab fabricated an aluminum pendant task light based on the PAR-38 spotlight. Similar lights, also by Litelab, hang in the museum gift shop. “In the outdoor space, within the space of the canopy, we made the conscious decision to not continue the same lighting from inside, but rather create a space that would be darker, more comfortable, and more environmentally friendly,” said Herzog & de Meuron. “The contrast of the lighting from outside to inside also allows the interior spaces to glow from within.” To diffuse the light from the column-mounted fixtures (BEGA-US), the designers commissioned custom bent steel plate light reflectors from American Architectural Metals and Glass.